The photo above has to be one of my favourites. 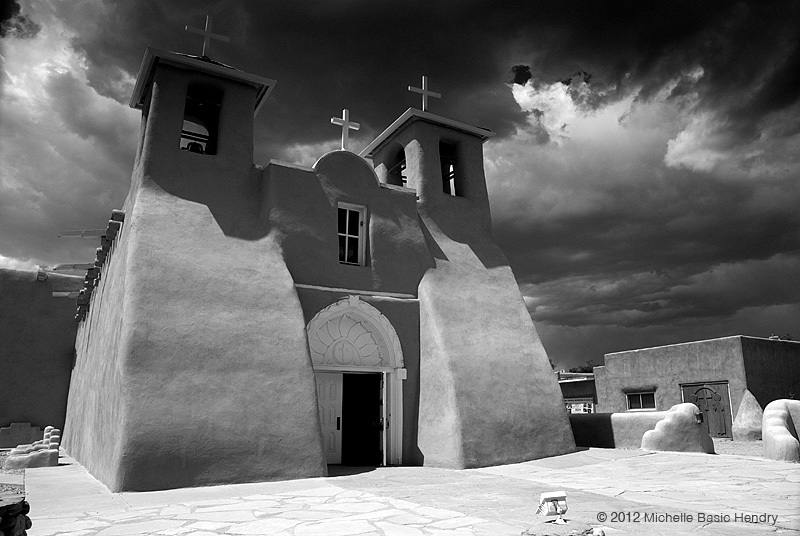 My husband and I spent that early July day touring Taos and the Rio Grande gorge with this being the last stop of the day, the St. Francis de Asis Church in Ranchos de Taos. One of the most painted and photographed churches in the Southwest, it was made famous by the likes of Ansel Adams and Georgia O’Keeffe. The clouds conspired to make this photo one of my rare black and whites in recent years. Storms had been circling the plateau all day placing a dark backdrop for sunlit dust devils. On the road back to the mountain pass there opened up a view across the Rio Grande rift to the steely grey mountains on the other side. From the charcoal forge of Titans, pillars of dust rose from the desert like the dancing golden fingers of God tickling the Earth as if his purpose was to reveal all her secrets in a single ephemeral moment. The magic of New Mexico is in constant flux, moving from one corner to the next shifting clouds and distant storms bend the famous New Mexico light revealing a riot of colour and mutable forms. My first painting in a while was inspired by none other than the ‘house’. The “House of a Thousand Doors” makes me think that although I am surrounded by magnificent landscapes, I still find myself wandering back to the walls and windows of the places in which we hold our dreams. The change in architecture has been almost a culture shock. 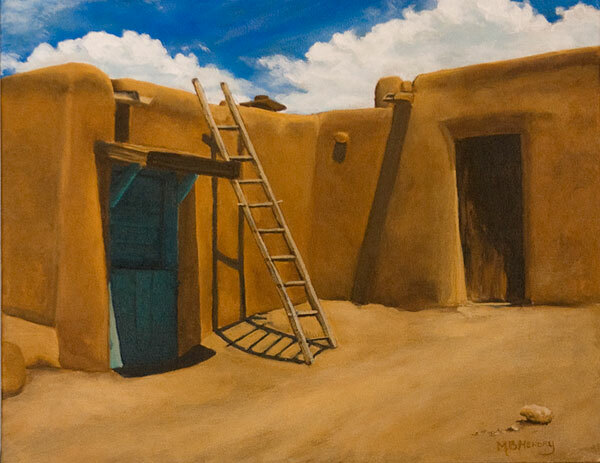 The language of adobe walls flows and seems much more accessible than it actually is. They grow up from a landscape full of mystery and magic so it is no surprise they hold their secrets closely.I am anxious to see where they take me. This year has been a strict teacher so far and further to my late May post “Geography“, change is coming. I think it comes best from a period of quiet contemplation and solitary work. I feel like a caterpillar bursting my seams and the cocoon calls me to the place where transformation happens in silence, unseen. So this will be the beginning of a summer hiatus. I hope it offers hints as to what is to come… My writing blog will still be active from time to time during this period. I am hoping to change the appearance of the blog in the coming months as well to better suit where things are going. See you in the Autumn. I really enjoy reading about your adventures and love your writing! I always look forward to your artwork and blogging. Love the new bright sky against the warm yellow stone. You definitely have come to a new place. I finally subscribed by email to your ‘writing’ blog, because I was missing posts. Nobody ever believes the light there ’til they see it. Thanks, Ingrid. I remember this church very well. I am not really a church fan, but this church is somehow special, it has probably something to do with the adobe style, which I like very much. I wish you all the best during your hiatus and hopefully there will be more blogs about the southwest in the fall! That’s too bad that churches aren’t your thing. I find them – when empty especially – to be rather remarkable places for contemplation. This one was preparing for a wedding while we were there. And yes, adobe is an amazing building material. The textures are intriguing! If the painting currently on the easel means anything, a change is coming.